Discussion in 'Pregnancy - Second Trimester' started by TryingAgain, Sep 18, 2007. 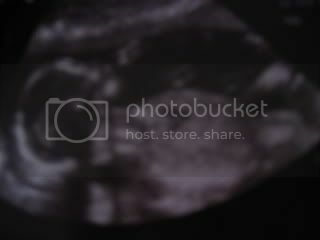 Thought i'd share my photos with you all, everything went really well on friday, baby was wriggleing all over the place, lol! I took a photo of the scan pic, so they aren't that clear!! Are you more relaxed now? is it just me or does it look like hes grasping on to something?? nice pics!!! 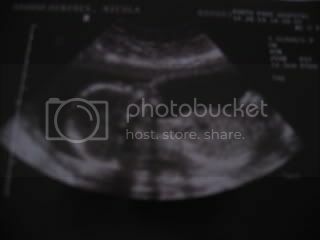 congrats on your scan! Cute scan pics and lovely bump. 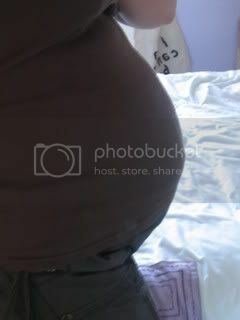 Great scan pictures and you have a real fabby bump hun!! Lovely pictures. Those have to be scan pics from around 18-20+ weeks, right? I remember when I first saw my lil man when he had turned into a 'real baby' lol, I was amazed, especially when I saw all his bones. They're so cute when they're like that.. aww.